Adam Faulkner, who is in seventh grade, has created a Google Desktop search plug-in that displays the verse of the day from BibleGateway.com. 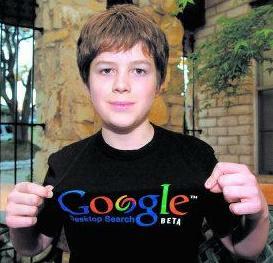 Along with the status of being a Google programmer, Adam also received a Google Desktop T-shirt (see picture). Adam submitted the plug-in to Google this year. The search engine giant e-mailed him in February, saying it liked his work. Adam Faulkner is now one of about 150 plug-ins featured on Google's plug-in Web site.